iSadness: Is This Goodbye, Click-Wheeled iPod? Oh sadness, nostalgia. 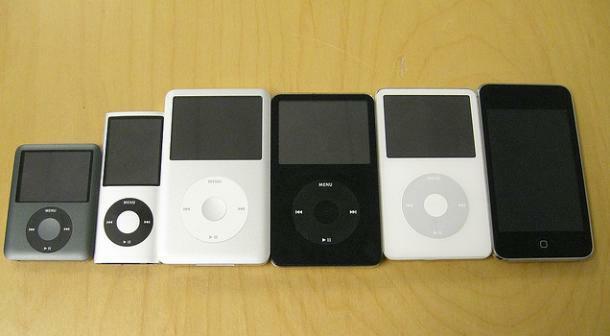 Seems that the old black, white and silver iPods we knew and loved might be bound for the scrap heap. While CNET chews over its own theory about the inevitability of forced iPod obsolescence, TUAW has it on good authority (from one of its tipsters) that Apple is planning to kill all non touchscreened iPods. If true, that would mean the iPod Shuffle and the iPod Classic are not long for this world. That alone isn't reason enough to mourn, but there are other compelling arguments that seem to point to the same thing: Apple certainly didn't spotlight it for its fall media event (actually, they didn't mention it at all). And despite having a rep for keeping their product lines minimal, the mother ship now has four totally different versions of iPods on the market, not to mention the iPhone and iPad. Likely this is what prompted the company to indicate some sort of "product transition" on its last call with investors. Then there's the fact that the product line is a bit long in the tooth. The first iPod came out 10 years ago. No matter how you slice it, that's practically prehistoric in the tech realm. Extremely impressive, yes, but positively ancient. The current iPod Classic, in fact, is still modeled on that old "spinny" drived original design — even as Apple transitions its wares over to solid state/flash drives. So yeah, like I said — sadness. I think the writing might be on the wall for the dear old iPod, and I'm seriously sad about it. Whatever you think of Apple or its other products, it's hard to deny the historic impact of this one device. The iPod was a veritable cultural phenomenon, one that forever changed the trajectory of both the entertainment and mobile industries. And whenever it is that it takes its final bow, it will be sorely missed. P.S. Word to the wise: If you're interested in either the iPod Classic or the Shuffle, be ready to snag them at a moment's notice. As often with discontinued stuff, you'll probably see supply wonkiness — either huge, fast discounts to rid old inventory and/or tons of out-of-stock notices. Either way, be prepared to pounce!